Operators can realize labor cost savings with innovative deep fryers. If you ask restaurant operators about innovations in deep frying, many would point to improvements in automation and speed of production. Yet others, like Lou Meyer, would cite actual labor savings realized in using a closed-loop, self-filtering and self-replenishing fryer oil system. As vice president of operations of The Briad Group, a large franchisee of Wendy’s and TGI Friday’s restaurants, Meyer began testing such systems a decade ago. The simplicity of frying management systems that were self-filtering and whose hot waste oil was not drained into hand-moved containers was revolutionary, he says. "If I were to put a number on it, I’d say these systems save us 30 minutes a day since there’s no refilling or cleaning done by our staff," Meyer says. "There’s no one hauling old oil outside; there’s no one opening up cans and pouring it back in, and there’s no deep cleaning. "So while 30 minutes a day might not seem like a lot, when you have as many restaurants as we do which are open almost every day of the year, that adds up to a lot." 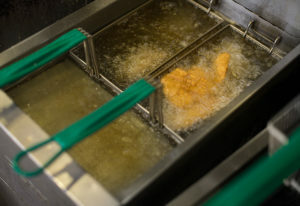 Briad uses a Total Oil Management system made by Restaurant Technologies that works like this: Connected to a bank of deep fryers are two tanks, one holding 1,500 pounds of fresh oil, another holding 1,500 pounds of waste oil. When the oil needs filtering or removal, the oil is either filtered or pumped into the waste reservoir. Using a manually operated wand, fresh oil is pumped back into fryers by the kitchen staff. Via a data link, the system’s tanks automatically notify Restaurant Technologies when fresh oil needs delivery, waste oil needs trucking away or both. By accessing a port in the exterior wall of the restaurant, a single truck can accomplish both functions in minutes. From fryer to delivery, the entire loop is closed. "When I started in restaurants, all that was done manually and it would be a mess — a scary mess sometimes," Meyer says. Not only did he see employees suffer burns moving hot oil to the outside waste receptacle, but "that oil would attract bugs and animals and things you never wanted on a restaurant property. That we don’t ever have to do that now is amazing to me." Mike Keeler, a consultant on restaurant safety strategy, agrees with Meyer, saying the removal of nearly every step from the old but still practiced ways of fryer oil maintenance allows workers to focus more on product quality. It also lowers labor turnover and potential overtime when someone is injured cleaning and refilling fryers. "You’re not leaving the line to get a 50-pound box of oil from storage, and you’re not risking someone injuring themselves picking up that 50 pounds the wrong way," says Keeler, formerly head of operational safety at Yum! Brands and Bloomin’ Brands. "When you don’t have a trail of oil following you out the back door to where you dump it, the chance that you’ll slip and get hurt goes down dramatically." The system saves managers time as well by relieving them from having to check on fryer standard operating procedures manually. Monitoring technology alerts managers when oil hasn’t been filtered or has been disposed of before it’s spent. When oil needs to be filtered, a manager’s key is inserted to begin the process and filtration happens quickly. "It’s not even a big deal: you cycle off and filter that fryer’s oil, and it’s done in just a couple of minutes." And, as Meyer says, since the system communicates its needs for waste oil disposal or fresh oil replenishment automatically, managers aren’t spending time managing another SKU (stock keeping unit) in inventory. When crumb accumulation in the fryer well necessitates that it be drained, Meyer says cooks don’t have to remove the build up by hand. Using the flow of oil from the replenishment wand, they direct the crumbs down the drain where they’re filtered out. "It’s so much faster and safer than it was before," he says. "You just spray the oil back into the fryer; crumbs are filtered out, and the only thing you change at the end of the night is the filter." "We used to have to pay to have fryer oil hauled away, but now they pay us for it because it gets recycled," Meyer says. The payment, he adds, is actually a credit to his account for the service. "But for us, this isn’t about getting money for recycled oil. This saves us labor dollars, which is more important than ever with wages going up like they are now."